Quick post on my first stop last Sunday. 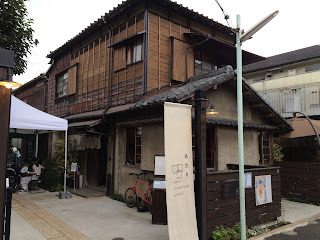 Yanaka Beer Hall is a fairly new place (I believe) and is a pretty unusual location for a craft beer place. I suspect it might be particularly exciting for visitors to Japan, but I still enjoyed it a lot too. The big selling point is probably not the beer but the building, but let's be honest, we probably wouldn't be going here if they didn't also have the beer. - Great building. Seems to share space with a bakery and it was a little difficult to work out where one finished and the other started, but all you need to now is that it's not really a hall at all, and it consists of a couple of rooms in a traditional style Japanese house and some seats outside in various areas. There's seating for probably around 20 and a couple of standing areas, so it's not exactly huge. It was certainly a fairly unique experience drinking nice beer in what must have been someone's front room a few years ago. Given the location and the lack of seats, it does seem that it can get quite busy, so if you don't want to hang around waiting and are not happy standing at one of the standing counters, I would get there as close to opening time as possible. - Five taps of August beer. I'm not sure how close the connection is, but it's August all the way here. They have one special that you can only get here which is their Yanaka Beer Hall Original Lager. The other taps were the Snow Blanche (called White here), Original, IPA and the special was the Maduro. If you're not a fan of August, I guess this is maybe not the place for you. Served in three sizes, small (around 300ml), medium (around 400ml) and large (big, maybe 500 or 600ml). Quite difficult to judge the sizes as I'm not good at that kind of thing and the glasses are a slightly different shape. Prices are ¥600, ¥900 and ¥1200 respectively. Depending on whether I have guessed the sizes properly, not bad value. They also have a four beer flight for ¥1200. Order at the bar and pay as you go. No cover charge! So, it's a really nice building and drinking there is an a pretty unique experience. The opening hours are a little strange in that it only seems to be open during the daytime, but as you know, I'm all in favour of that kind of thing. It's probably more designed for people to pop in for a beer or two when they are in the area rather than heading across town and having a heavy session. Definitely a nice place to take people visiting though. I must admit, I have a bit of a soft spot for August beer. I really liked their Snow Blanche a few years ago when I last had it, so I should probably revisit it again soon. It's also nice to have somewhere to drink August that is not in Roppongi as I have a bit of an aversion to that area. Oooh. Back in April 2017, this neighborhood was the one in Tokyo where the FlyerTalk Japan Do'ers were led on a morning tour. The bakery was one of the stops. The Beer Hall was indicated to us. I did not want to begin drinking so early in the day, so I just took a few photographs. Here they are.